happy TSA worker, or passive aggressive? 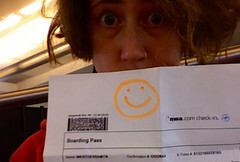 I had to hand this smiley face to a bunch of people at the airport. This was the "this person cleared security" indicator that the TSA drivers license checker put on my boarding pass. I found it amusing, but you know how these TSA people are. "No jokes please!" etc Did I hand someone a joke?